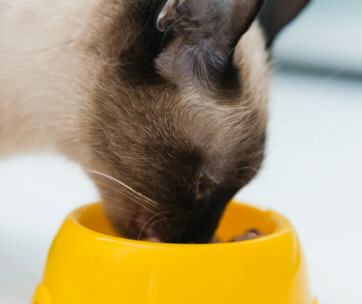 When you think about your cat’s diet, you don’t necessarily think about the fiber content. The protein content is something that owners tend to be more interested in. Yet, this essential nutrient plays a huge role in keeping your kitty healthy and choosing the best high fiber cat food will play a role in that. Your vet can advise you about what the best fiber content would be for your cat. Some cats have benefitted from a high fiber diet. It is thought to play a role in weight management and this is especially important for indoor cats. It also plays a role in maintaining a healthy digestion. Cats with both constipation and diarrhea have benefited from a change in fiber content. However, the type and quality of the fiber are just as important as the quantity. 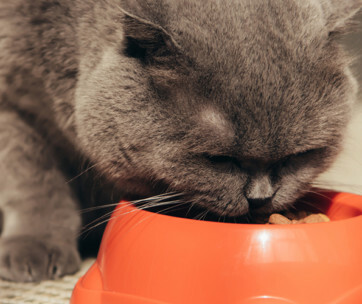 To help you out with this confusing situation, here’s our guide to the best high fiber cat food. Based on the natural diet of the Lynx, the fiber content of this high fiber dry cat food is a maximum of 7.2 per cent. It contains a high-quality source of protein in the form of turkey and chicken meal and deboned chicken. There are also healthy, complex carbohydrates which are easily digested and provide plenty of energy. The fiber content has been carefully worked out and comprises two natural fiber sources which are cellulose and psyllium seed husks. Therefore, the food is useful for controlling your cat’s weight and can play a part in reducing hairballs too. The formulation is fortified with immune-boosting minerals and vitamins. There are no meat by-product meals and no corn, wheat or soy. This cat kibble has plenty of protein and fiber to keep your cat healthy. The protein content is 38 per cent and is provided by turkey and chicken meal as well as deboned chicken. There are no by-product meals in this food. The fiber content is all natural. 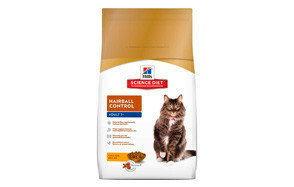 It has been specifically formulated for indoor cats who have a more sedentary lifestyle face different health issues. You won’t find any unnecessary grains used as fillers and no soy or artificial additives. To help with weight management, there is 20 per cent less fat than in many commercial cat kibbles. 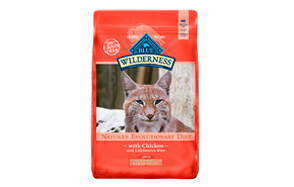 This is a generic kibble that will suit cats of all ages who live indoors or who have an outdoor lifestyle. For protein there is chicken meal and chicken and this is blended with a carefully balanced recipe of carbohydrates, fats, minerals and vitamins. The mineral content includes calcium and phosphorous which are essential for building strong bones. The fiber content is ‘layered’ so it provides all the different types of fiber that your cat’s body needs for a healthy digestion. The recipe contains no artificial additives. This recipe contains a blend of natural fiber which is high-quality and supports a healthy digestive system and is useful for eliminating hairballs. It has plenty of protein thanks to the primary meat ingredient which is real chicken. To this are added micro-nutrients including omega oils and vitamin E. Both of these are important for skin health. The recipe is easy on a cat’s digestion and contains no artificial additives to provide color or flavors or to preservative the product. There are no meat by-products. There are also added antioxidants to help your cat fight off diseases. This high fiber wet cat food has been formulated for cats with food sensitivities and allergies. It is suitable for use in a limited ingredients diet. The main ingredient is the source of protein which can be duck, chicken or salmon. Duck is a very popular choice in elimination diets as so few cats are allergic to it. There is no poultry by-product meal. To help your cat’s sensitive digestion, there is no gluten or grain content so it is very easy to digest. There are added micro-nutrients including omega fatty acids. These are great for a healthy skin. Despite this being a grain-free, natural formulation, it has plenty of fiber. This makes it suitable for cats that have an indoor lifestyle and who would benefit from more fiber in their diet. The fiber content is from natural sources such as chickpeas. It also helps them to avoid obesity by having a reduced fat and total calorie content. The L-Carnitine content speeds up the metabolism and prevent them from putting on weight. The high-quality source of protein is whole chicken and it contains no rendered meat by-product meals which can upset a cat’s delicate intestines. Also, none of the farm animals used for this recipe are factory-farmed or raised using antibiotics. With turkey as the primary ingredient, this high protein dry cat food delivers a balanced diet for cats that like to live indoors. These cats can suffer from obesity and intestinal issues and this cat food has ingredients to tackle that. The added micro-nutrients (including omega 6 fatty acids) have been carefully chosen to promote healthy intestines and skin and coat. To avoid food allergies and wasted calories, you won’t find any fillers in this recipe. It has a blend of natural dietary fiber which is important for weight management and cuts down on fur balls. It also promotes dental health because the kibble is great at scraping off plaque. You can use this wet cat food in elimination diets because it is made with only limited ingredients. It can be very useful for feeding cats with known food allergies. The single, high-quality, source of protein is either farmed rabbit, duck or turkey. All three of these meats rarely cause allergic reactions in cats. They are also easily digestible and therefore suitable for a cat’s sensitive digestion. The vegetable content is provided by peas which are also easy to digest. The recipe contains none of the common allergens such as grain, eggs, dairy products or soy. It is suitable for cats of all lifestyles and ages. There is a carefully blended fiber in this premium sensitive stomach cat food. There are also prebiotics which are kind to a cat’s digestion as well as beet pulp The balanced recipe contains all the nutrients that your cat needs whatever their age or lifestyle. The protein content is provided by chicken which is also easy to digest. There are plenty of micro-nutrients including omega oils and vitamins. It’s hard to help a cat with chronic diarrhea or constipation and it can take a long time to work out what is causing it. This product is a therapeutic cat fiber supplement that you sprinkle over your cat’s food. It helps the intestines to regulate and helps your cat to poop regularly and with a normal consistency. It works by providing soluble fiber which helps to regulate the way food passes through the gut. It also contains antioxidants to help with immunity. The ingredients list is very simple for this product, it contains only 100 per cent organic pumpkin which has been dried and powdered. Many owners are used to checking the protein content of cat food but are not so sure about the fiber content. Fiber plays a vital role in maintaining your cat’s intestinal health so it is an important consideration. Many digestive problems in cats are associated with a lack of the correct fiber in their diet. Your vet can advise you about the correct diet for your cat based on their age, breed and lifestyle. They will also take any health conditions and allergies into consideration. If you are looking for a high fiber cat food, here are some of the things you should look out for. The type of cat fiber is just as important as the crude quantity. Some fiber helps with diarrhea and some constipation. Often it is a case of trial and error. Natural sources of fiber are always best and grains are best avoided. Natural fibers help to repair intestines that have been damaged by food allergies. Foods that have a source of moderately fermentable fiber are very beneficial as they can help with both constipation and diarrhea. It is found in peas and pumpkin. It is important that the protein content is high, irrespective of the fiber content. Cats need to obtain their protein from high quality meat sources and a high protein high fiber diet suits many cats. Beef is a common allergen for cats and is best avoided. You may want to choose a high fiber food that also has ‘limited ingredients’. In this type of food, the nutritional content is provided by just a few ingredients. This makes it easier for owners of cats with allergies. For the same reason, you should get used to looking out for the ingredients that have not been added to the food. 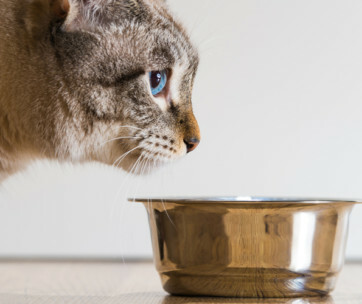 If you have a cat with digestive problems or with a sensitive digestion, you will probably want to avoid grains (wheat and corn), soy, artificial additives and meat by-product meals. High fiber diets are often targeted at indoor cats as they help with weight management. The recipe will have been formulated to match the calorie content with your cat’s requirements. Hairballs can cause misery for cats and foods that help to eliminate them are helpful. Look out for foods with fiber in them that specify that they help with hairballs. They may also contain micro-nutrients to keep the coat healthy. As well as containing plenty of fiber, the food needs to provide balanced nutrition so it can keep your cat healthy. It’s best to buy food that has high-quality protein and carbohydrate sources and that has plenty of vitamins and minerals. Domestic cats don’t get any fiber from eating prey and so they need it from commercial cat food. Some experts believe that indoor cats, in particular, would benefit from a diet that is high in fiber. Here are some of the reasons why. 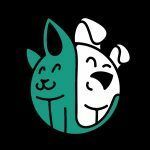 How is diet connected to hairballs? You may see some foods with labels such as ‘hairball formula’ and ‘hairball reduction’ and they contain micro-nutrients such as fatty acids that minimize hair loss. This prevents the hair balls from forming in the first place. Also, the fiber content helps the transport of food in the intestine and this takes hairs with it. They pass out harmlessly in the poop. A blend of different types of fiber is needed so the type of fiber is just as important as the overall amount. Many cats, especially those that have indoor lifestyles, are overweight. In fact, studies estimated that at least half of the cats in the US are obese. Some diets are labelled ‘for weight management’. 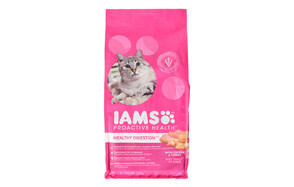 They have a blend of fiber that makes sure that your kitty feels full up after they have eaten. The fiber has no calories and simply passes through the body. Some cats have chronic diarrhea and that makes their litter tray pretty unpleasant to clean out. Others have constipation which is very uncomfortable for them. A cat with a healthy digestion will poop regularly and they will be well-formed. Some fiber draws water into the large intestine, making poop softer and easing constipation. Other fiber slows down the passage of food through the intestine so water is removed from it and diarrhea is avoided. High fiber cat food for constipation will not help with diarrhea! Fiber in the diet can be classed as animal-derived or plant-derived. Plant fiber can be further subdivided into soluble and insoluble. Typical examples of soluble fiber are gum or pectin. They absorb water into the poop and make it softer. They also make the food travel faster through the gut which prevents constipation. Insoluble fiber is provided by things like cellulose and the hulls of peanuts. They bulk out the poop and make it travel more slowly through the gut. This helps with diarrhea. Only your vet can recommend a high fiber food for your cat because there are some risks associated with it. It is possible for the fiber to get stored as fat which is not what you want for weight management! Many high fiber diet for cats have a higher carbohydrate content and this can interfere with protein absorption. When cats get inadequate protein, the metabolism slows down and they can put on weight. This is why you need to look at more than the fiber content alone. Also look for a food that is high in protein. Fiber is cheaper than protein and some manufacturers increase the fiber content at the expense of the protein content. Also, check whether the fiber is soluble or insoluble as they serve different purposes in the intestines. Q: What is Fiber Anyway? A: Fiber is an essential nutrient that consists of cellulose, lignin, and pectin. It is not broken down by the body and therefore passes all the way through the intestines. All mammals need fiber but some need more than others. Fiber can be derived from plants or animals. In the wild, the fur, bone, cartilage and intestinal content of prey would provide the natural fiber in a cat’s diet. Q: How Much Fiber Does My Cat Need? A: The fiber content of cat food is very variable. It is difficult to pinpoint the exact amount that is suitable for a cat because all cats are different. They are all at different ages, of different breeds and have different lifestyles. Rather than picking a food just by looking at the fiber content, it is best to choose a food that is suitable for your cat. The more sensible approach is to look at the sources of fiber. Gentle natural fibers and a mixture of different types of fiber will be beneficial for most cats. Q: How Do I Know If My Cat Might Be In Need Of High Fiber Food? A: Your vet can advise on this. There is a misconception that all obese cats are lacking fiber and that cats with diarrhea need more fiber in their diet. This is not necessarily true. There are plenty of other causes of both obesity and diarrhea. It’s true that fiber can slow the passage of food through the gut and therefore make the poop more solid. It is also true that some cats will lose weight on a high fiber diet but that does not mean that it suits all cats. Always consult your vet before making changes to your cat’s diet or if you are concerned about their intestinal health or their weight. Our top pick of the best high fiber cat food is modelled on the natural Lynx diet. It has a high fiber content (maximum of 7.2 per cent) to aid digestion. It is also high in protein and this is provided by chicken and turkey meal and deboned chicken. Healthy complex carbohydrates provide energy. The fiber is provided by cellulose and psyllium seed husks. It can help with weight control, hairballs and digestive issues. There are vitamins and minerals to promote general health and it contains no meat by-product meals, corn, wheat or soy.